1. Milk and cereal. My daughter likes to eat cereal and thankfully, there are about a hundred varieties available. Cereals make good breakfast and snack options. You may also serve instant oat meal with lots of milk. Cereals and oats are rich in fiber to promote a healthy digestive system. 2. Smoothies. Just mix fruit, yogurt or milk, and ice in a blender and whip up a healthy refreshment for your little ones. You may mix two or three fruits, and even throw in a carrot or a tomato every once in a while. 3. DIY ice candies or popsicles. Commercially bought popsicles contain artificial sweeteners that are not only unhealthy but may also cause tooth decay. If you can, make your own ice candies or popsicles at home. You can have them in any flavor such as fruit juice, chocolate, and buko. Just put in a mold and freeze! 4. Keep a fruit bowl within reach. A bowl of bananas, oranges, apples, and grapes on the table look pleasing to the eye, and irresistible to kids. Fruits are naturally sweet so most children love them. Dried fruits like raisins also make healthy snacks for kids. 5. Champorado or goto. Make rice more interesting with chocolate (champorado) or ginger (goto). These are easy to make and I have yet to know a kid that does not like either. Champorado is best served with lots of milk while you may add chicken strips or hard-boiled egg to your lugaw. 6. Cheese slices. Who doesn't love cheese? Cut cheese into fun shapes and serve with plain crackers. 7. Peanut butter. Peanut butter is an all-time kids' favorite. Try serving it with mini-waffles, bananas, or even rice cakes to make a healthier treat. 8. Taho (sweetened soy bean curd) - If your neighborhood is lucky enough to be part of a taho vendor's daily route, go ahead and buy your children a cup. Ask the vendor to slightly lessen the amount of caramelized sugar. You may also make taho with the help of this recipe, if you are interested. 9. Go Mexican. 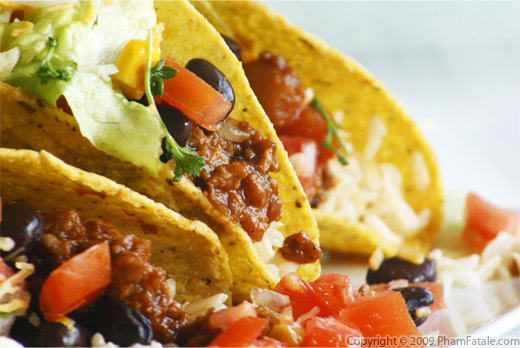 For something out of the ordinary, serve quesadillas, tacos, or nachos for snacks and spice things up a bit. You can make them different each time with various ingredients like chicken, cheese, and vegetables. Make your own salsa dips or you may buy ready-made dips from the supermarket. 10. Eggs. How does your child want his egg? My daughter likes hers either hard-boiled or scrambled so I prepare it for her some days. Scrambled, poached, boiled, or rolled - eggs are a rich source of protein. 11. Kakanin - The Philippines offers a large variety of kakanin or sweet meats that make healthy snacks for kids. These are easy to find - and love. Find out which kind your child loves and serve it often. Keep stocks of puto, palitaw, suman, kutsinta, or bibingka at home to be enjoyed after school or after playtime. 12. Graham crackers. Graham crackers are easy to find, budget-friendly, delicious, and healthier than average cookies. Mix them with fruit and cream, peanut butter, or serve as is. 13. Gelatin. Making gelatin is easy. I remember having fun as a kid waiting for the hot mixture to solidify into the mold. Kids would also surely enjoy making - and eating - gelatin pudding with you. 14. Healthy sandwiches. Enlist your children's participation in creating sandwiches. Have all ingredients laid out (lettuce, ham, cheese, tomatoes, etc.) and allow them to create their own sandwiches! Kids tend to appreciate food more if they took part in the preparations. 15. Nuts. Nuts make healthy snacks for kids as well because they are a source of good fats. They would surely enjoy munching on peanuts, cashew nuts, almonds, or mixed nuts. Naomi, 27, is married six years to her husband, Gan, and is mom to almost-seven-year-old Nini-pie. She spends most of her day in front of the computer, working as freelance copywriter. Apart from eating out with her family, she likes reading, art, watching suspense thriller films, football, going to the beach, tweeting, and cooking (although whether that last one likes her back is still subject to debate). ....and we're back! Nice one Naoms.I'l surely be trying some of these on my kids. thank you for the comment mommy kelly hehe. got hungry while writing this, too. specially craving for tacos! I love nuts! Can't get enough of them when I was a kid, can't stop eating them even as an adult. xD Great post Naomi! Another healthy snack is yogurt. When my kid was a toddler he loved eating Nestle Yogurt and I was glad he did because it's such a healthy snack.